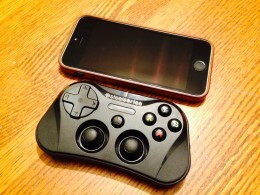 Apple’s foray into offering official controller support for games on the App Store has been an odd one for sure. They originally announced Made For iOS (MFi) controller support as part of the new iOS 7 at WWDC last June, but like practically all things to do with gaming and Apple, it was announced as almost an aside to the real presentation, just getting a brief mention on a slide. People have been asking Apple to implement some sort of standard controller support for years now, so you’d think that them finally giving into that request would be a bigger deal, but no. Then, things got even stranger as any talk of MFi controller support all but disappeared save for some leaked photos or documents here or there. When iOS 7 finally did arrive in September, and even games themselves began seeing updates with official MFi controller support, there still was no sign of actual controllers or any sort of word from Apple as to what the heck was going on. It was all just very… strange. Finally, in mid-November, the first actual iOS 7 controllers began to appear. First to market was Moga’s Ace Power followed by Logitech’s Powershell. Both controllers required the iOS device to be seated inside the unit itself and connected via Lightning, which immediately dampens their usefulness as they’d only work with iPhone 5/5s or 5th generation iPod touch devices. iPad owners were left out. Most recently, SteelSeries released their own controller called the Stratus, and it ended up being the best of the bunch just by virtue of connecting via Bluetooth instead of Lightning. So it could be used with iPhone or iPad devices, though it lacked the device charging functionality of the other two because of it. Still, all three of those controllers suffered from some serious drawbacks. First and foremost was the cost. All three will run you a hundred bucks, quite a bit more than your average third party controller on other platforms, and even nearly double what a first party controller would run you for the Xbox or PlayStation. The second big issue was the build quality. None of the iOS 7 controllers felt like a piece of hardware that should cost a hundred bucks, and in fact they all felt flimsy in their own ways. The third problem was that, despite iOS 7 and the MFi controller API being available to developers for nearly six months, very few of those developers had actual hardware to test on, so the controller functionality itself fell short of expectations in many games. So, why is it so difficult for controller makers, developers and Apple all to get on the same page and offer up the type of premium controller experience that gamers have been waiting for? Well, 9to5Mac dug into the situation and talked to several developers and employees of controller manufacturers to get some answers. Part of the problem was that that first batch of iOS 7 controllers was rushed to get them out before the 2013 holiday season. Beyond that, Apple’s own MFi requirements have driven the price up for making these controllers, which in turn drives the price up for consumers. As an example, Apple at this time requires all controller manufacturers to source their pressure-sensitive buttons from a single Apple-approved supplier. If these manufacturers were able to use their own suppliers, they’d likely be able to save some money in the manufacturing process. Coupled with the license fees associated with getting approved as an MFi controller from Apple, it’s no wonder these things are in the hundred dollar range. Another issue is the requirements of the MFi program. In theory, having a standard set of guidelines all controller makers must follow means that developers can offer controller support in their games and know that they will work with the whole fleet of MFi controllers on market. However, some of those requirements just don’t make sense or aren’t specific enough. As 9to5Mac notes, MFi controllers must contain a circular d-pad as opposed to a “plus-shaped" d-pad or even the d-pad that’s separated into four buttons like you’d find on a PlayStation controller. Most gamers would agree that either of those options are far superior to the circular style d-pads (just ask fans of fighting games how they feel about the Xbox 360’s d-pad), yet, we’re stuck with those circular ones as a requirement. Another issue is the range of motion of the analog sticks and pressure-sensetive buttons, which some developers feel should be held to a more specific standard. As of right now, the various controllers that are on the market vary in these areas, which means that developers must try to cater their controller support to each one specifically if possible. This sort of thing is exactly why Apple has an MFi program in the first place, but those areas and others sure could use some fine-tuning. You really should check out the full feature over at 9to5Mac as they’ve come across some very interesting information in their report. However, all of this just leads me back to a word we’ve tossed around a lot in all of our coverage of MFi controllers: potential. There’s no holiday to rush for anymore, so I think in 2014 we’ll see more controller manufacturers spending the time they need to get their offerings just right. Also, as Apple works more with controller manufacturers and game developers, hopefully they’ll loosen the reigns on things like which suppliers manufacturers can use as well as tighten the reigns on things like joystick and button sensitivity. While the MFi controllers that are out there currently are decent enough, I think in time we’ll see things get smoothed out significantly, and the world of controlling your iOS games with reasonably priced and well-built controllers will finally see its full–wait for it–potential.